Macalester Library is facilitating access to Ingenta content via a pay-per-view (PPV) model. This allows instant desktop delivery of articles and book chapters from a variety of publishers. Purchased articles/book chapters can be downloaded and stored locally for future use. Each full-text document downloaded deducts money from the library budget. This option is a means of access when Interlibrary loan is not an option. 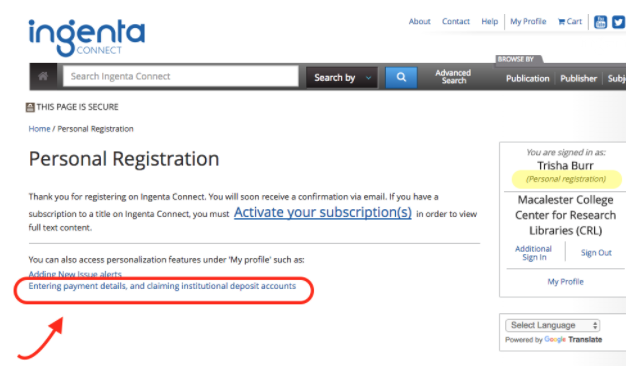 Below are the steps for creating an Ingenta PPV account. This will allow you to purchase articles on the Ingenta platform using Macalester College Library funds that are on account. These steps only need to be completed once. On the “Payment details” page you will need to enter in your payment account number and payment account password. These are provided by your Library Rep.
From this point on, when you are logged into Ingenta with your personal account you should be able to purchase articles from Macalester’s funds on account. You should now be able to open up and save your article. You have 48 hours to download the article and save it. If Macalester subscribes to the title, you will automatically be given access to the article and extra funds will not be deducted. 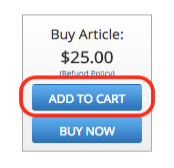 If the article you are purchasing is published by Elsevier, you will be linked to the ScienceDirect web site. Once you are at the ScienceDirect site, you should log in with your department’s ScienceDirect pay-per-view login to complete the purchase. You are welcome to download articles for students using your departmental account. However, Interlibrary loan may be the best option for students when time permits. Students can also be referred to the service desk (in person, phone or email).